February is Feel the Love month! Our February promotion is all about love! In store we are hanging our hearts on our best loved items. Find an item in store with a heart hanging on it and you will automatically get a discount on that item when you purchase it. You’re gonna love this month! This month we are featuring our most-loved items. Look for our hearts around the stores where our staff will highlight their favourite items! These best-loved items can be purchased at 10% off on the days they are featured, throughout the month, but you have to come into your local Instep store to see where our hearts are! Capezio Hairnets – The essential bun-making tool for dancers! Invisible hair nets keep a dancer’s bun looking neat and tidy for ballet class. These are durable, stay put, and can be used multiple times. 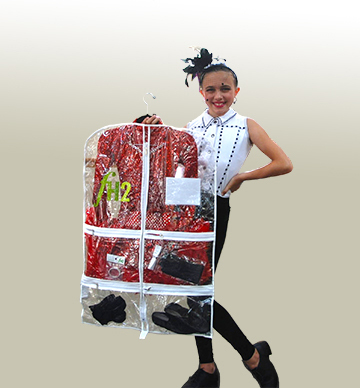 fH2 Clear Garment Bags – The ultimate organizer for a dancer’s costumes! Keep your shoes, tights, accessories and costume in on complete bag and easily see the costume you are looking for. Bodywrappers A61/C61 Fishnet Tights – Seamless fishnet dance tights available in child and adult sizes. At this time of year, pre-competitive dance season, these are the top 3 most requested items. These items will be included in our month-long feature but you have to visit the store to see where the hearts are! This is the perfect time to pick up that extra pair of tights, organize your dance costumes, and prepare your hair and make-up bag. Once dance competitions are in full swing, it is better to be prepared than to be searching for an item before you have to go on stage!